SUBHEAD: Radical democrats in favor of legalizing drugs and offering asylum to Edward Snowden running for office. 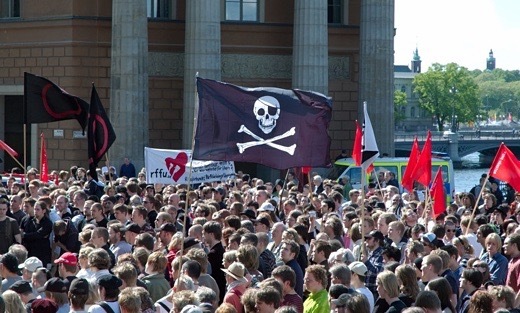 Image above: Gathering in June of 2015 in support of Pirate Party. From (https://talesfromtheloublog.wordpress.com/category/iceland/). The election, likely to be held on 29 October, follows the resignation of Iceland’s former prime minister Sigmundur Davið Gunnlaugsson, who became the first major victim of the Panama Papers in April after the leaked legal documents revealed he had millions of pounds of family money offshore. In the face of some of the largest protests the small North Atlantic island nation had ever seen, the ruling Progressive and Independence parties replaced Gunnlaugsson with the agriculture and fisheries minister, Sigurður Ingi Jóhannsson, and promised elections before the end of the year. Founded four years ago by a group of activists and hackers as part of an international anti-copyright movement, Iceland’s Pirates captured 5% of the vote in 2013 elections, winning three seats in the country’s 63-member parliament, the Althingi. “Then, they were clearly a protest vote against the establishment,” said Eva Heida Önnudóttir, a political scientist at the University of Iceland who compares the party’s appeal to Icelandic voters to that of Spain’s Podemos, or Syriza in Greece. Propelled by public outrage at what is widely perceived as endemic cronyism in Icelandic politics and the seeming impunity of the country’s wealthy few, support for the party – which hangs a skull-and-crossbones flag in its parliamentary office – has rocketed. A poll of polls for the online news outlet Kjarninn in late June had the Pirates comfortably the country’s largest party on 28.3%, four points clear of their closest rival, the conservative Independence party. That lead has since narrowed slightly but most analysts are confident the Pirates will return between 18 and 20 MPs to the Althingi in October, putting them in a strong position to form Iceland’s next government. 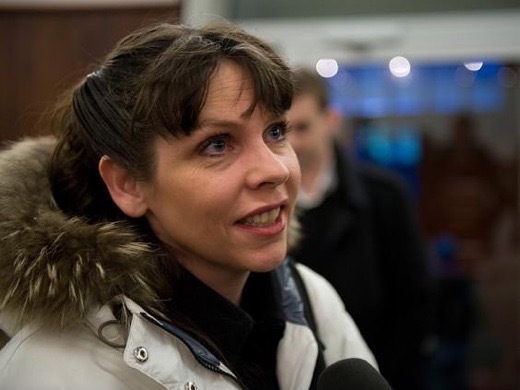 Image above: Birgitta Jonsdottir, a co-founder of Iceland's Pirate Party. From (http://www.independent.co.uk/news/world/europe/iceland-pirate-party-takes-big-lead-in-polls-ahead-of-election-next-year-a6834366.html). Jónsdóttir said the party was willing to form a government with any coalition partner who subscribes to its agenda of “fundamental system change” – something the Independence party has already ruled out. Built on the belief that new technologies can help promote civic engagement and government transparency and accountability, the party believes in an “unlimited right” for citizens to be involved in the political decisions that affect them, with ordinary voters able to propose new legislation and decide on it in national referendums. It also wants no limit on individuals’ rights to express their views and share information, unless doing so violates others’ rights, and proposes to decriminalise drugs, raise taxes on the rich, and pursue internet freedoms and copyright reform. This article was amended on Satuday 13 August 2016 to remove a reference to “Gunnlaugsson’s Independence party”. As pointed out in comments below, Gunnlaugsson is the chairman of the Progressive party.